Lebanon's prime minister says U.S. Secretary of State Condoleezza Rice has arrived there, in a surprise visit as part of U.S. efforts to help achieve a cease fire in the war between Israel and Lebanon-based Hezbollah. The Lebanese government announcement says Rice arrived in Beirut Monday and is expected to meet with Prime Minister Fuad Saniora before she traveling to Israel, her originally announced destination. As fierce fighting continues in the 13-day-old war Israel and the Lebanon-based Islamic militia Hezbollah, diplomats have been exchanging offers of peace, warnings and threats. Saudi Arabia Sunday asked President Bush to intervene in Israel's military campaign against Hezbollah in Lebanon to stop the mounting deaths. "We are requesting a cease fire to allow for a cessation of hostilities," Saudi Foreign Minister Prince Saud al-Faisal said after an Oval Office meeting with Mr. Bush. Saud said he gave the president a letter from Saudi King Abdullah asking that Mr. Bush help seek an immediate cease fire in the Middle East conflict. Rice also participated in the meeting before departing for Israel in the first U.S. diplomatic effort on the ground since Israel began bombing Lebanon. "We believe that a cease fire is urgent," Rice said early Monday, commenting during a refueling stop at Shannon Airport in Ireland on her way to the Mideast. "It is important, however, to have conditions that will make it sustainable." Rice says she has been consulting with the United Nations and Israeli officials about possible elements of a cease fire agreement that could ensure Lebanon has control of its country. The U.S. Secretary of State dismissed critics who say the U.S. should talk directly to Syria - which has been accused of supplying weapons to Hezbollah, the militant group at war with Israel - to bring about peace in the region. She noted that the U.S. does have a mission in Damascus through which the U.S. can talk to the Syrian government, but she said those attempts have been futile in the past. "Let's remember we talked to the Syrians over and over and over again. Colin Powell talked to the Syrians, [former deputy secretary of state and current ConocoPhillips board member] Rich Armitage talked to the Syrians," said Rice. "The problem isn't people haven't talked to the Syrians – it's that the Syrians haven't acted." 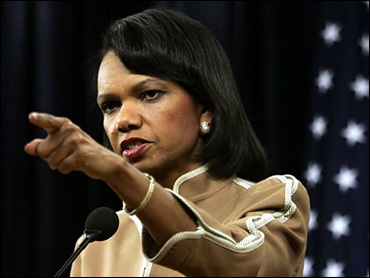 Rice insisted "plenty of people" have been sending messages to the Syria to stop supporting terrorism and "not to meddle in the affairs of Lebanon." She told reporters she wasn't sure if Syria and Iran have any misgivings about supporting Hezbollah, but said: "I would think if they want good relations, they might start by ending their support in those ways." Syria has said that it will press for a cease fire, but only in the framework of a broader Mideast peace initiative. The Israeli army said Monday that one of its helicopters has crashed near the Lebanese border, wounding at least six soldiers. The U.S. says most Americans who want to leave Lebanon have done so, and U.S. evacuation efforts are nearly complete. U.S. officials say approximately 11,260 American citizens have been transported out of Lebanon since July 16th. Some 1,600 American citizens departed Beirut Sunday and 2,800 more are scheduled to depart on July 24. At least 381 have been killed and 1,507 wounded in Lebanon, according to Lebanese security officials. Among them are 20 Lebanese army soldiers and at least 11 Hezbollah guerrillas. Among the civilian deaths are 8 Canadians, 2 Kuwaiti nationals, 1 Iraqi, 1 Sri Lankan, 1 Jordanian. Thirty-six Israelis have been killed, including 19 members of the military, according to authorities. More than nine soldiers have been wounded, and 255 civilians, according to rescue officials. Lebanese security officials say a photographer working for a Lebanese magazine was killed Sunday when an Israeli strike hit near her taxi in southern Lebanon. Layal Nejib, 23, is the first journalist to die in the nearly two-week-old war. Lebanese security officials say Israeli warplanes Sunday struck a minibus carrying people fleeing the fighting in southern Lebanon, killing three people, while in northern Israel, two civilians were killed by Hezbollah rockets. Hezbollah rockets hit a house, an apartment building and a major road. CBS News chief foreign correspondent Lara Logan reports Sunday's barrage hit dangerously close to Haifa's oil refinery, the city's most strategic target. Rockets also fell elsewhere across northern Israel Sunday. One barrage targeted an Israeli artillery unit. Witnesses say the rockets set fire to the brush but no one was hurt. Israeli military officials said their forces captured two Hezbollah guerrillas on Sunday. The officials spoke on condition of anonymity because they were not authorized to talk to reporters. Israel Army Radio reported the two were the first prisoners Israel has taken in this offensive. The U.S. is delivering a shipment of "bunker-buster" bombs to Israel. Israel is replenishing its stockpile of precision-guided GBU-28 bombs, reports CBS News National Security Correspondent David Martin, and the bombs are part of an arms package that Israel can tap into whenever it needs. Israeli officials say the army has been using precision-guided weapons to minimize harm to civilians. Israel bombed a textile factory in the border town of al-Manara, killing one person and wounding two, according to the mayor of the town. The United Nations' top humanitarian official on Sunday inspected the air raid damage in Beirut as he began a relief mission to Lebanon. "This is a senseless war," Jan Egeland told CBS News correspondent Richard Roth. "It should never have started, should never be carried out like it is now." U.N. Secretary General Kofi Annan says the conflict has created some 700,000 refugees so far, and Israel's destruction of bridges and roads has made access to them difficult. As part of an effort to avert a possible humanitarian crisis, Israel eased its blockade of Lebanon's ports to allow the first shipments of aid to arrive. Israel hit the southern port of Sidon for the first time on Saturday, destroying a religious complex linked to Hezbollah and wounding four people. More than 35,000 people streaming north from the heart of the war zone had swamped the city, which is teetering under the weight of refugees. Rice is willing to talk about the role that international peacekeeping troops could play in the region, reports CBS News Correspondent Joie Chen, so long as Americans are not among them. "She will be talking with our friends and allies about whether and when a force is appropriate and how it might be constructed," said White House Chief of Staff Josh Bolten. "Rice's trip illustrates the need for the U.S. to be involved in a comprehensive Middle East peace effort that is shaped around the framework established by the U.N. in Resolution 1559 - passed by the world powers two years ago - which called for the disarming of Hezbollah," says CBS Foreign Affairs Analyst Pamela Falk. "The Security Council meeting at the U.N. this past week underscored the need to make certain that her trip involves the moderate Arab states in the mediation efforts to keep Syria from rearming militias in the region." "Syria and Spain are working to achieve a cease fire, a prisoners' swap and to start a peace process as one package," Syrian Information Minister Mohsen Bilal told the Spanish daily newspaper ABC during an interview in Madrid. "What we are calling for is de-escalation, diplomatic engagement and for the United States to restart playing the role it used to play in the past, the role of the broker of peace," Dr. Imad Moustapha, the Syrian ambassador in Washington, said on CBS's Face The Nation. But U.S. Ambassador to the United Nations John Bolton said Syria "doesn't need dialogue to know what they need to do. They need to lean on Hezbollah to get them to release the two captured Israeli soldiers and stop the launch of rockets against innocent Israeli civilians." "Syria, along with Iran, is really part of the problem because of their longtime support for Hezbollah and other armed groups inside Lebanon," Bolton told "Fox News Sunday." "So I don't know what that adds necessarily, although I suppose it's better than nothing." "We support Hezbollah because Hezbollah is a national liberation movement," Moustapha told Bob Schieffer. "Everybody should understand that the issue in the Middle East, the true issue is the ongoing Israeli occupation of our territories." It is unlikely that Israel would agree to Syria's conditions, but the remarks were the first indication of Syria's willingness to be involved in international efforts to defuse the Lebanese crisis. The offer also came with a warning. "If Israel invades Lebanon and enters it by land, then it will be only about 12 miles from Damascus, then we will not stand with our hands tied," Bilal said. Iranian President Mahmoud Ahmadinejad said Israel had "pushed the button of its own destruction" by attacking Iranian-backed Hezbollah in Lebanon. He didn't elaborate, but suggested Islamic nations and others could somehow isolate Israel and its main backers led by the United States. Israeli Defense Minister Amir Peretz met with German Foreign Minister Frank-Walter Steinmeier, one of a series of diplomatic meetings aimed at ending the fighting. French Foreign Minister Philippe Douste-Blazy was also in Israel. On a tour of Haifa, Douste-Blazy was chased into a stairwell by air-raid sirens and incoming missiles. "The goal is to create a situation in which we have as broad a space for diplomatic movement as possible," Peretz said after meeting Steinmeier. "The goals we set for ourselves will be achieved. We certainly see a combination of a military operation that is fulfilling its role plus broad international activity to complete the process." Israel said it would accept a NATO-led international force to keep the peace along the border. "We would like to see an effective force, which has some capabilities to defend itself, and, also, to bring law and order," Daniel Ayalon, the Israeli Ambassador in Washington, said on Face The Nation.